Over the summer I worked with a program called The Road Less Travelled. The Road Less Travelled is a service learning program which sends high school students around the world to do service in a certain place, then to have an adventure in that country. I participated in their El Sendero program. 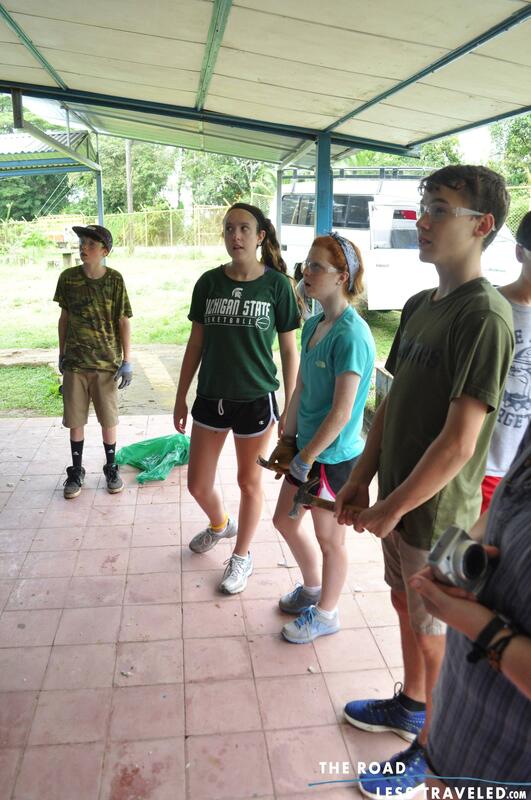 The El Sendero program sends students to Costa Rica. The first day of the program was spent in San Jose, the capital, buying food and meeting my fellow travelers. After that day we transferred to the school we were going to work at. The school was a two hour drive into the heart of the eastern Costa Rican jungle. As our bus pulled in we were greeted by the beaming smiles of the local kids. It was their last day of school before a two week break and they were in the middle of an intense water fight. After about twenty minutes of talking with some of the more audacious kids the teachers at the school brought all the kids together in the small class room. Before they performed their D.A.R.E presentations we introduced ourselves by name, in spanish to everyone. After that the kids left to swim in the river and we cleaned out the classroom to set up our beds where we would sleep for the next week. Once we were done setting up we started our first half day of work. For the next nine days we worked on a variety of different projects including digging trenches for water overflow, breaking down old wood walls and reconstructing them with concrete, mending desks, painting and rebuilding broken paths. Before I started this project I viewed service as a chore, just another thing that is required for school, but once I saw the happy look on the students faces’ as they looked at their renovated school I realized that service changes people’s lives. Service helps those in need, and makes those people feel important. I was so happy looking back on what I had done to help the school. “Gracias para todo,” a little boy named kevin told me, No i said back, “gracias.” I thanked him, he showed me what helping others truly means and how much care and work can affect someone for the better. More pictures are available at this link. This entry was posted in Uncategorized and tagged Yurchuk by 16wakefield. Bookmark the permalink. Thank you for your reflection, Atticus. I appreciate your identification of service’s benefit as always being two-fold–servers are positively transformed, as are the served. I’m a member of the Friends Service Committee, and I was at first drawn to your post by the exotic location in which your service was performed. However, upon reading your reflection I was most struck by the transformation that took place with regards to your relationship with service; that service quickly went from being a “chore” to a very enjoyable and transformative experience. As Jason mentioned previously, I think we at times lose sight of how beneficial service can be for not only those we serve, but for ourselves as we perform and reflect upon our experiences. I hope that you will be inspired to continue positively changing the lives of others. Sounds like an incredible trip and an even more incredible personal journey. Thanks for sharing it with us!